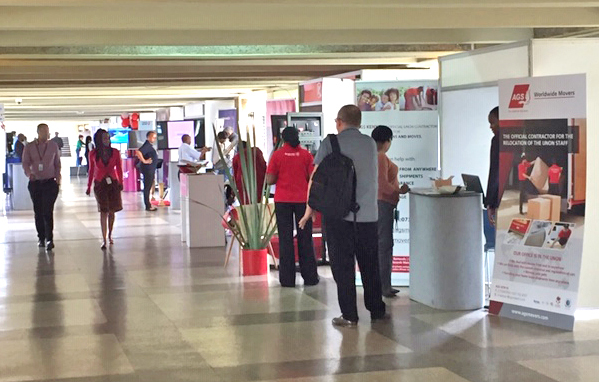 AGS Kenya recently attended an Information Day organised by the United Nations Office in Nairobi. The event provided the perfect opportunity to network and establish potential business partners. AGS Movers Kenya recently participated in an information day organised by the United Nations Office in Nairobi (UNON). The event, which took place on 15 November 2018, was held at the UNON’s premises and was intended to inform and offer UNON employees an array of services including, tour operators, hoteliers, airlines, movers, etc. 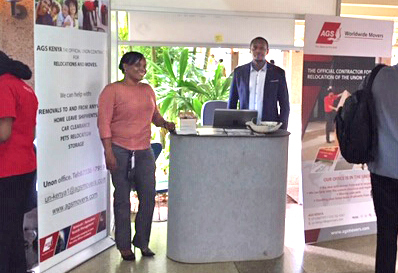 AGS Kenya set up a stand and three members of the team including Branch Manager, Gil Recizac, Fridah Mwangi and Steve Maina assisted visitors with their queries and presented the branch’s range of services. Removals for 2019, animal transfers and expedition processes were some of the topics that were addressed by those who visited the stand. Additionally, contact was also established with the administrative departments of UNICEF (United Nations International Children’s Emergency Fund) and UNHCR (Office of the United Nations High Commissioner for Refugees). AGS Kenya will meet with them again in the near future to discuss potential business opportunities. This day was the perfect opportunity for the AGS team to meet representatives of the human resources and procurement departments of UNON, as well as the archiving manager who they presented AGS’s digitization service to.